Any parent that has gone through this stage, would definitely agree that teething is most definitely a memorable (and painful) milestone for your baby. Babies usually start teething between three to six months of age. Nevertheless, in some instances, some babies are born with a tooth already in place, and others do not end up with teeth until after their first birthday. Teething is a tough and stressful time for both the baby and the parents! Crankiness and difficulty sleeping are commonly reported problems. However, the good news is, there are ways for help ease the discomfort of teething for the baby. When babies start teething, they naturally reach for things to bite, in order to soothe their poor sore gums. The best thing that you can do during this time, is to provide a safe and natural teething ring that your baby can safely chew on. Look for a teething ring like the one pictured above, from CanvasAvenue.com, which is crafted from natural untreated wood, and is BPA and chemical free. These are safe and comfortable for babies to chew, and unlike silicone or plastic, they are completely natural. 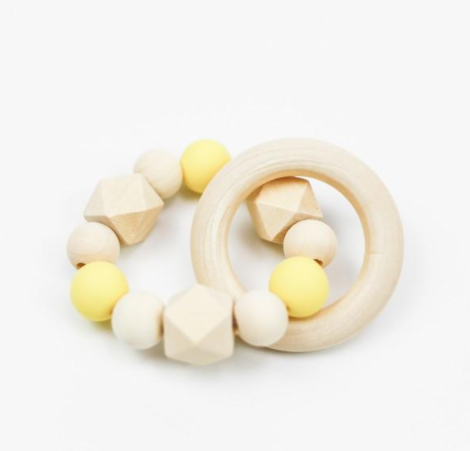 As a bonus, these teething rings not only are there to help provide relief for the baby’s gums but double as stylish toys too! When babies are not in an immediate need to chomp on the rings, they can stay stimulated by studying the texture and shapes of the ring. In between uses, simply give your teething ring a quick rinse in warm soapy water, and let it air dry. Last but not least, don’t fret, mama or papa, this too will be over!